Russet potatoes - quartered middles removed and set aside. 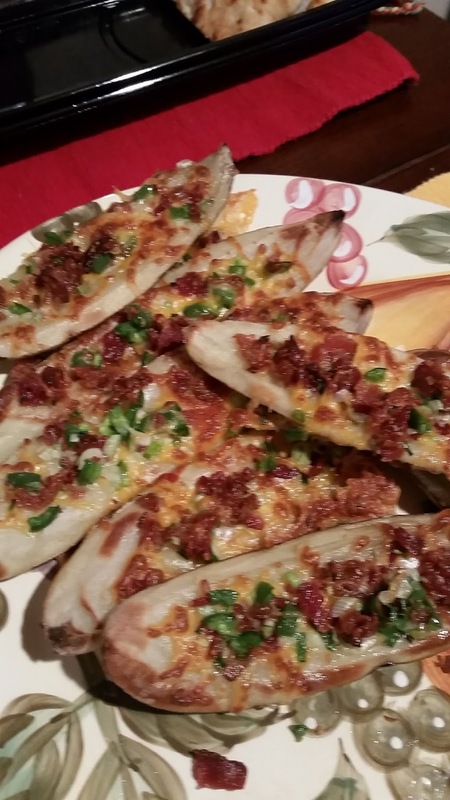 Place potato skins on cookie sheet and bake for 30 minutes or until tender. Remove from oven. Sprinkle with shredded cheese, then bacon, onion and chives and then sprinkle again with cheese. Broil for about 10 minutes and serve. Take the middle of potatoes and cut into spears for fries. Coat in olive oil, toss in garlic salt and set aside for fries back on 450 degrees for 20 - 30 minutes until tender. Serve with burger or dogs.